One area people often neglect during a home paint project is their interior doors. Sometimes this is because they simply don’t think about it; in other cases, people may be paralyzed and unable to decide which color to choose. This quick and easy guide will walk you through why painting interior doors is so important and give you tips to do it right. Imagine: you pull up in a shiny new sports car and everyone oohs and ahhhs … until they notice a huge scuff across the driver’s side door. Then the crowd falls silent. That’s what it’s like when you’ve updated all the paint within a room and have left out your doors. While everything else looks great, the part that’s dingy or has been bumped around will draw everyone’s eye like a sore thumb. By updating all the paint, you’ll ensure that the entire project looks beautiful. Another reason to update interior doors? It’s a great way to throw in some unexpected accent colors. We’ll get into the controversy surrounding color selection in the next section. To Match the Walls or Not? One of the reasons people often hesitate to paint their interior doors along with the rest of the house is that they’re unsure where to go in terms of color. Should interior door colors match the walls in the room or is it ok for them to differ? The answer is that there is no correct answer. Painting the doors the same color as the walls will look nice and understated. Taking the doors a shade or two lighter or darker from the walls is a wonderful way to accent in a subtle way. To make the ultimate statement, however, paint the doors a totally different shade. Make sure it’s something that complements an element in the room — a piece of furniture or a prominent piece of artwork, perhaps. You’ll also need to make a color choice about the door frame; many people choose to paint the frame and the door the same color. You might also choose to paint the frame the same color as the wall and the door an entirely different color. To really shake things up, try painting one side of the door one color and choose a different hue for the opposite side. Hesitant to go bold with your door colors? You can always test out options using SureSwatch. It’s easy to paint up as many as you want, apply them to the door, and simply leave them there so that you can check out the tones during different times of the day and night to see which one works best. 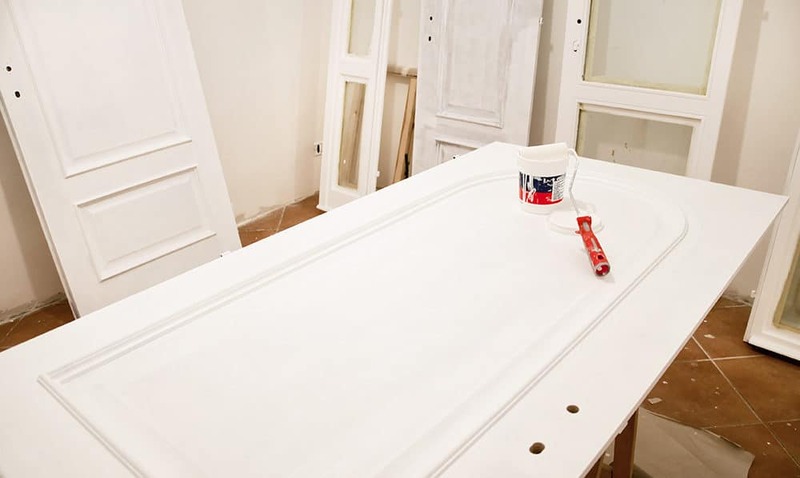 Once you’re ready to get started, resist the urge to remove the door from its hinges to paint it; it will dry much more easily if it’s hanging upright. Clean the door with a degreaser or soap and water and dry it thoroughly before you begin. If you’re going to use an oil-based paint, make sure to take the time to sand the door first so the paint will stick. As you paint, start at the inside bottom of the door and move your way up. Paint across the top and only then move back down the outside of the door. Don’t paint the inside edges of the door; doing so will cause it to stick if it expands due to heat or humidity. Once they’re all dried and ready to go, you’ll find that painting the interior doors of your home truly makes your rooms pop. It may take a little extra time, but it’s a project that’s well worth it!